Want an easy way to enhance physical performance and ease sore or tight muscles after exercise? Spend some time on a foam roller. This self-massage tool can release and soften the connective tissue around muscles called fascia, as well as ease knots and tender trigger points that build up over time. Foam rolling should be performed gently and at multiple angles to enhance the effects on the fascia and nervous system. “Roll until you start to feel fluid movement and a release of pain or tightness,” says Kemp. Often this takes about 30–60 seconds. It’s okay if the feeling is a bit uncomfortable, but if you feel sharp pain, back off. “Be sure to also relax your jaw, and breathe softly but deeply while rolling to encourage the release of facial layers,” she says. In her practice, Kemp often instructs clients to roll along the IT band that runs down the outside of the leg, as well as the glute muscles, calves, upper back and inside of the arms to release chest tightness from habitual work at computers. 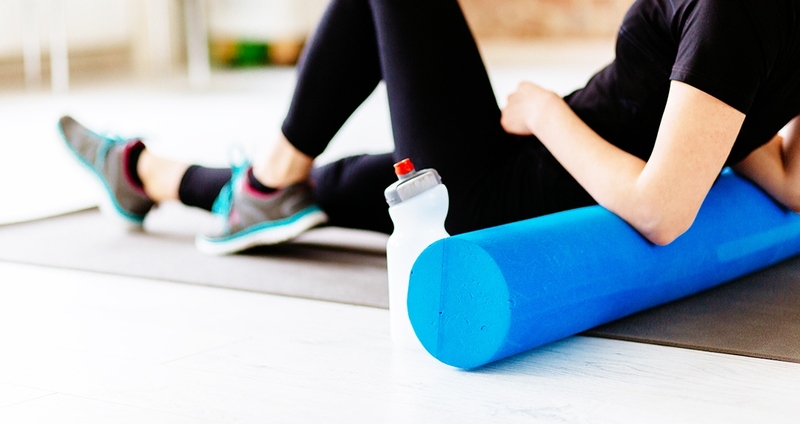 “Foam rolling is not enough to heal most injuries, but it can improve the performance of fascia and decrease pain,” she says. Ideally you want rolling to become a habit of self-care; so doing it every day is a great practice, as long as you don’t feel like you are bruising areas. You also want to roll slowly, and steer clear of bony areas like knee caps. When shopping for a foam roller, there are three main considerations: density, surface texture, and shape and size. If you are new to foam rolling, choose one on the softer side and then progress to one that’s denser as your technique improves and your muscles adapt. You’ll also want to start with a fairly long roller (36 inches) that has a smooth surface rather than one with ridges or knobs. They’re generally less expensive and provide even pressure along the length of the roller.